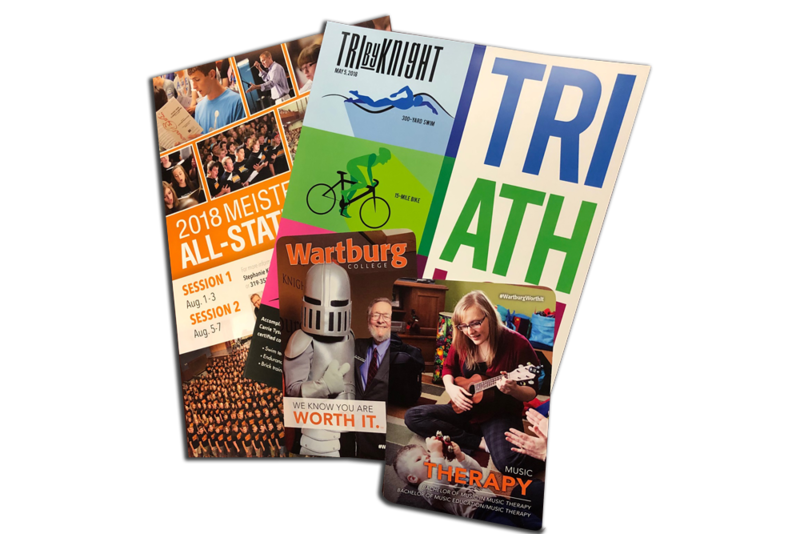 The Wartburg Print Center, a division of the Marketing & Communication Office, is located on the south end of the Saemann Student Center (next to the Information Desk). The center provides printing services to the campus community as well as businesses and individuals throughout the Cedar Valley. Our business hours are Monday-Friday, 8 a.m.-4:30 p.m. (4 p.m. in summer). 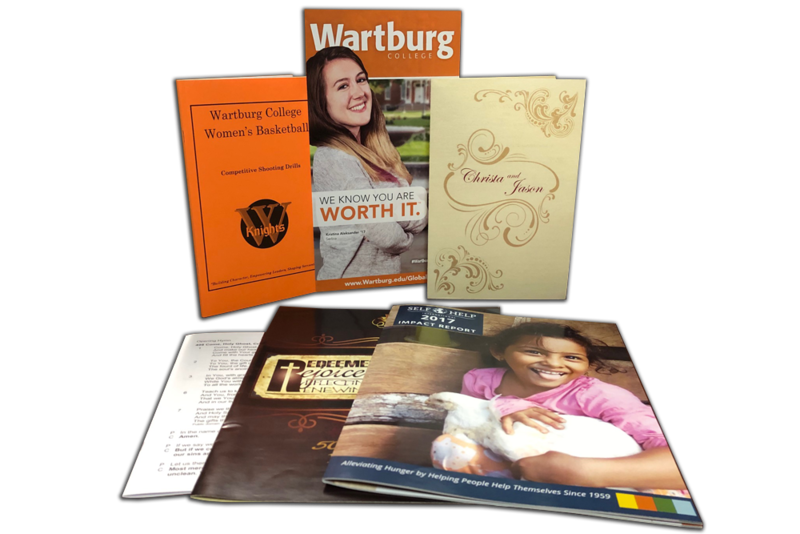 Projects should come to the Wartburg Print Center in a format ready for printing, but our staff is happy to help you with the set up if needed. Turn-around time for simple projects such as memos and letters is generally 24 hours or less. Jobs that involve extra finish work may require more time. – Jessica Gulick, The Larrabee Center, Inc. If you do recurring orders with the print center, feel free to login to the PrintShopPro link above. Use this software guide or call x8366 if you need help. All college offices and departments should work with their assigned account executive in the Marketing & Communication (M&C) Office for any marketing-related (events, recruitment, fundraising, etc.) projects. M&C does not charge for design, video, or photography if the projects are part of institutional marketing strategies. For all non-marketing (letters, course packets, exams, etc.) 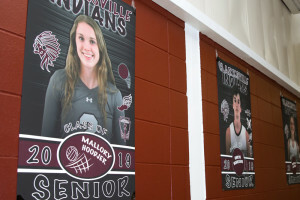 projects, individuals can work directly with print center staff to complete the projects. 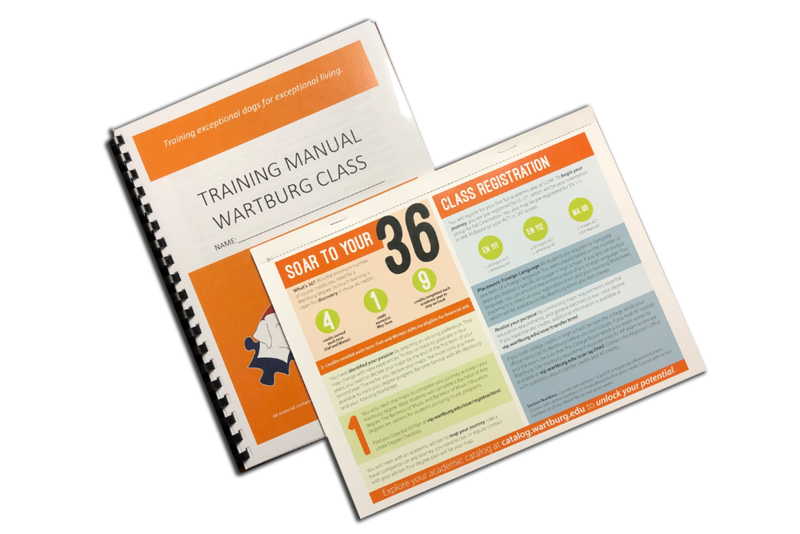 In cases where projects do not conform to Wartburg printing guidelines (such as wrong logo usage or improper layout), the Digital Print Center will notify the customer and send it to Marketing and Communication for reworking or design modification. Turn-around will be dependent upon designer availability and the amount of work involved. 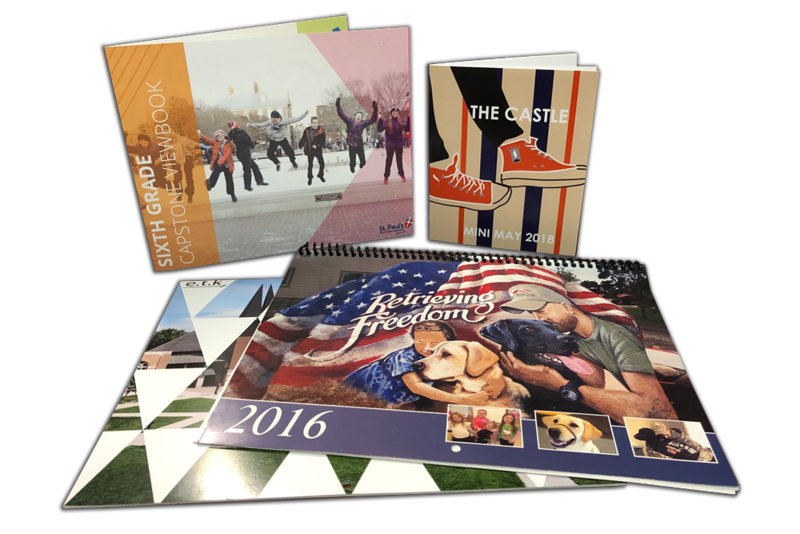 The print center can deliver any projects on campus when the project is complete. Turn-around time for simple projects such as memos and letters is generally 24 hours or less. Jobs that involve hand collating, folding, or stapling may require more time. Projects with large quantities also will require extra time. If you wish to have exams, quizzes, or other documents be printed in a more secure way, you can let the full-time print center staff know through email or when you submit your job through PrintShopPro. No student staff will be allowed to view, print, or deliver these materials. Your department office coordinator has access to our online ordering system. Click here for printorders.com instruction guide. For business cards with the photo/social media option, click here for instructions. To order toner or for copier service, contact ITS Help Desk, ext. 8767. To order paper for copiers, use PrintShop Pro® and place your order by clicking on New Order and drop down to STOREFRONT. Copy paper (8-1/2 x 11 only) will be charged to Campus Copiers Fleet, so make sure you change account name and number by using the drop-down menus. 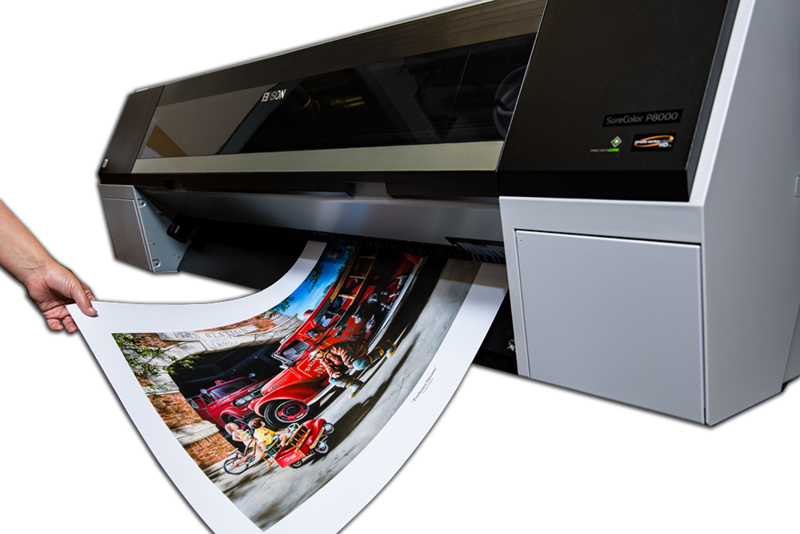 In addition, the print center can do faxing, laminating, and limited photo printing from electronic files. 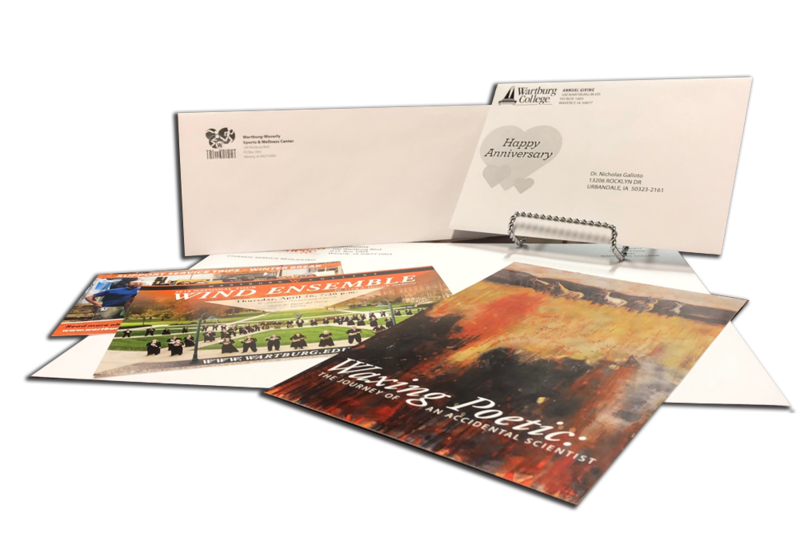 There are many varieties of papers and envelopes available. 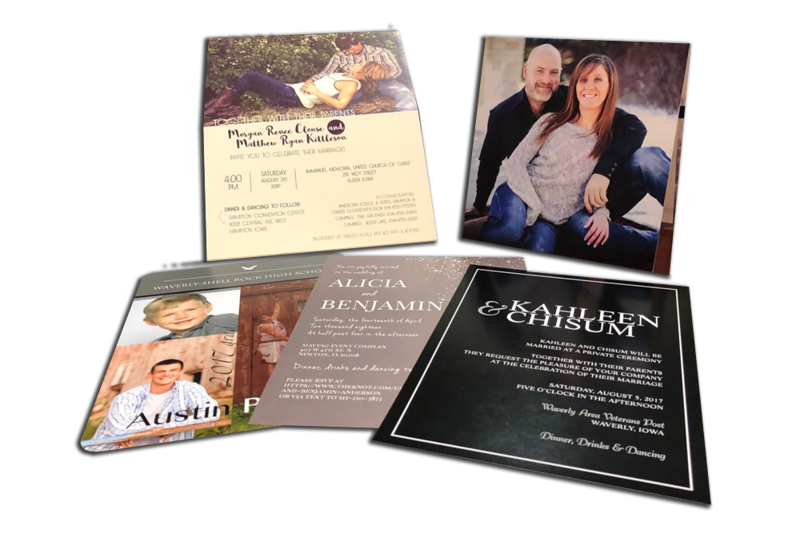 Matte, Gloss, or Vinyl – $4.50 sq. ft.
Canvas – $6 sq. ft. Maximum width: 44 in. | Maximum length: 40 ft.
FLYERS 8.5×11 color (gloss text weight)* – 35¢ ea. FLYERS W/BLEED 8.5×11 color (gloss text weight)* – 40¢ ea. BROCHURES tri-fold 8.5×11 (2-sided full color on gloss text)* – 64¢ ea. BROCHURES W/BLEED tri-fold 8.5×11 (2-sided full color on gloss text)* – 69¢ ea. POSTERS 11×17 color (gloss text weight) – 40¢ ea. POSTERS W/BLEED 11×17 color (gloss text weight)* – 44¢ ea. 12X18 COLOR POSTERS w/bleed (gloss cardstock)* – 51¢ ea. POSTCARDS 4.25 x 6 (2-sided color)* – 35¢ ea.